But propaganda is not something that just existed in the past: it is happening today—all around us. Are most educators taking advantage of this fact? I don’t think so. And neither does my colleague, University of Rhode Island media educator Renee Hobbs. “When people hear the term propaganda, they think about the Nazis in 20th century Germany and think propaganda is a historical phenomenon,” said Hobbs, creator of the new website resource, Mind Over Media: Analyzing Contemporary Propaganda. “But propaganda is an important part of our lives today. As a form of strategic communication that uses any means to shape attitudes, beliefs and behaviors, propaganda can be beneficial or harmful depending on the author’s purpose, context and situation,” she said. The creation of the Mind Over Media website grew out of Hobbs’ visit to the propaganda exhibit at the US Holocaust Museum in Washington DC. That exhibit deals with the Nazis’ sophisticated visual and written propaganda during WWII and the importance of educating the public to analyze and resist the manipulation of their minds. 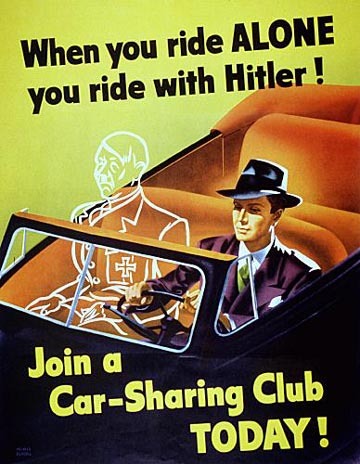 The website uses crowdsourcing to create a gallery of propaganda examples. Users upload content they’ve located, share their own interpretations, and then evaluate the impact of the images, web pages or videos. A button at the top of the website, For Teachers, offers excellent background as well as lesson plans that can be downloaded as Adobe PDF documents. Lesson plans have been correlated to Common Core ELA and History/Social Studies standards. Teachers can also use the site to address students’ digital literacy by using it to create a private, customized online gallery for students to analyze propaganda with members of their class. ► Upload..and share examples from your community. Can you define propaganda in your own words? Before introducing this topic to students, finding and identifying a definition you’re comfortable with is probably a good starting point. Most people don’t know what it is, including your students. The Mind Over Media website does a nice job of offering several different definitions. Contemporary propaganda often takes the form of commercials, specialized websites, and even tweets and Facebook posts. As students search for examples of content that meets this definition, everyone may be surprised by what they find. Read the examples below and ask your students if they think these are examples of propaganda. ► SeaWorld, responding to criticism, publishes an op-ed in the Wall Street Journal informing readers of the changes it has made to improve the environment of the killer whales at its theme parks. ► BP (British Petroleum) broadcasts a series of TV commercials, shortly after the Gulf Oil Spill, to show that things are back to normal along the coastlines of Florida, Alabama, Mississippi and Louisiana. ► The Koch brothers, acknowledged billionaires, purchase ad time during Comedy Central’s Daily Show with Jon Stewart. Their commercial touts their business and the impact it has on America. ► Two famous basketball players, Dwight Howard and LeBron James, have a dunking contest to determine who will watch the other eat a McDonald’s meal. ► A news photo shows President Obama flanked by doctors wearing white lab coats at a White House Rose Garden Ceremony advocating for the Affordable Care Act. ► A North Korean “exposé” of how Americans live, focused on images of street people. As you and your students can see from these examples, propaganda comes in many shapes and forms. The more exposure students have to it, the more likely they are to understand how it works. Want to know more about propaganda? Allow me to point you to my propaganda website at the Media Literacy Clearinghouse. You’ll find links to lesson plans, websites and readings, as well as recommended books and videos. ► The Propaganda Critic website from Aaron Delwiche is one that many educators have come to rely on. ► The National Council of Social Studies also provides its members a host of lesson plans and readings. ► The ReadWriteThink resource website also offers reading and English teachers a number of propaganda resources. With Campaign 2016 in full swing, teachers may want to have their students paying closer attention to the messages emanating not only from the presidential candidates but also from the political parties and Super PACs (click above). If the past is any indication of the future, there will be lots of propaganda messages ahead. Stay tuned.